Recently I did a video with Tennis Data Scientist and fellow tennis blogger Stephanie Kovalchik of Tennis Australia fame where she shared about the importance of data analysis at the top of the tennis game. Statistical data can help uncover patterns in problem areas and reveal winning ways at the highest level of play. Statistics are the life blood of most sports however tennis falls far behind in the race to gather data. Only 4 years earlier ESPN said that tennis was in the analytical dark ages. It is exciting to see new developments in data technology, such as “The Thin Edge of the Wedge” which won the prestigious Sloan Research competition, helping the top pros. Now there is also a new crop of sensors available to the general public which gives data feedback. Some of the innovators in this field are PIQ Babolat Play and Babolat Pop, Sony Senor, Zepp, Usense Intelligent Tennis Senor, QLIPP Tennis Sensor, Zepp Tennis 3D swing and more. I received a demo of the newest sensor called the PIQ Robot +1 Wristband for review rand was excited to see what data it could produce. To be clear this is not the version two of the Babolat POP sensor although it does use the same mobile name for the mobile app “Babolat POP”. 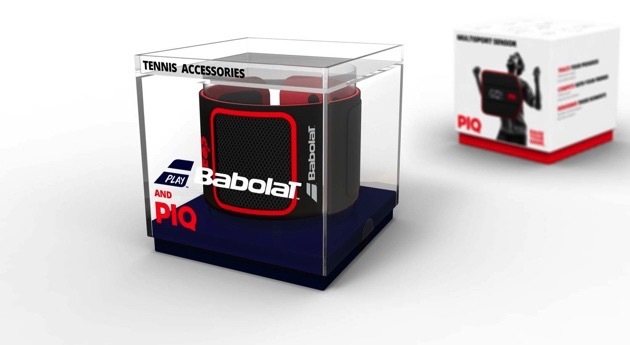 My sense is that PIQ is the true designer & manufacturer of the hardware product and that Babolat is the tennis distribution partner and software branding although I don’t pretend to know the company’s inner workings. You can see that this same PIQ sensor is branded with other sports app brands like Everlast for boxing and Rossignol for skiing. This is a wrist-worn sensor that attaches with a strong washable Velcro wristband. PIQ has made this sensor waterproof so no problems with moisture. The band is very light and weighs approximately 10 grams which I did not find bothersome. I typically wear a Tenex vibration dampener on my hitting arm so it did compete with that for arm space. It might also replace your sweat band but if your band is loose enough you could potentially wear it over this PIQ band as well. I didn’t notice any weight difference or change in my swing or game while wearing it. The sensor pairs via blue tooth with an app on your phone (iPhone in my case) and transmits data live to the phone. This could be especially helpful for coaches or hitting partners who are helping you or students with their game. I especially enjoyed the center of the racquet information as I stress this heavily while teaching and consider hitting the ball in the center 2nd only to footwork in importance for tennis players. It’s called a sensor but in fact, the PIQ technology is actually 13 sensors which measure movement, speed, data of the swing path and much more. Unlike the earlier versions of the POP sensor this multisport sensor has a LED display that reads out data such as speed of your serve directly on the wristband display with the press of a button so you don’t have to keep checking and syncing your phone. The display is very limited however and might be hard to see in certain lights since it is covered with the protective elastic red stretch material. The mobile app is extensive and gives a lot of data which I find really helpful. Key data collection point include: How many forehand, how many backhands, how many volleys. Within each stroke there is also deeper data for instance on backhands it shows how many top spin BHs, how many slice BHs, and how many flat. Each shot gives the average and maximum speed as well. I was surprised to see how little topspin I was actually hitting on my forehand and that the majority of my shots were flat. Time to watch more Rafael Nadal videos! The Skills section of the app can help me improve my topspin analysis through it’s challenge system. Much like a fitbit steps challenge, this component has options for the number of strokes in a session and analysis for that stroke so I could see a rise in topspin shots as I intentionally play with more topspin and have data to back up the “feeling” of how I am playing. In match play, I love the ability to get more data and create a winning strategy. While it doesn’t link data to a specific shot you hit, it can provide details of how differently you play during a match versus practice such as how you change your speed, shot selection and consistency (number of shots in a rally). One might also deduce that if you are hitting a lot more backhands in a match it is because that specific opponent is targeting your backhand. Similarly, if you are hitting a high number of overheads (which PIQ calls Smash) you can deduce that you are getting lobbed regularly. The PIQ sensor does not make any noise or beep and is not distracting to yourself and your opponent during play. There is a social media component called Community that allows you to compare your stats to players all over the word and even drill down to find players that are the same age, gender or country as you. It also compares your PIQ score with others to give you feedback on how high or in my case how low you compare. One side benefit of the PIQ sensor is the added drive it gives for one to collect more data and make self-improvement the focus while practicing or playing rather than getting lost in the emotion of the moment or angry at failure. In the long run, our tennis focus might be better suited on improvement rather than win or loss and the PIQ wristband is a great reminder of that significant motivation. Battery life for the sensor is rated at 8 hours and this sensor actually comes with a re-charger called the “PIQ fuel” that can recharge the sensor on the court three times without power connection. Once you are home, you connect the sensor back to the charger and charge both via USB cable. I really love the idea of data on the tennis court both for the professionals and for us. Far too many of us go by “feel” and emotion to know how well we are playing. This is a great way to get some tools which help us add to our human feel data with nano-computer technology from PIQ. Current retail price is $178 (street price around $149) and the app is free to download. I suggest this is a great investment in your improvement tennis toolkit.